We are delighted to present the fantastic Concealed Carry Crossbody Purse - Limited Edition "CHRISTY" CCW handbag - Black/Black Leather. With so many available recently, it is great to have a brand you can recognise. The Concealed Carry Crossbody Purse - Limited Edition "CHRISTY" CCW handbag - Black/Black Leather is certainly that and will be a perfect purchase. 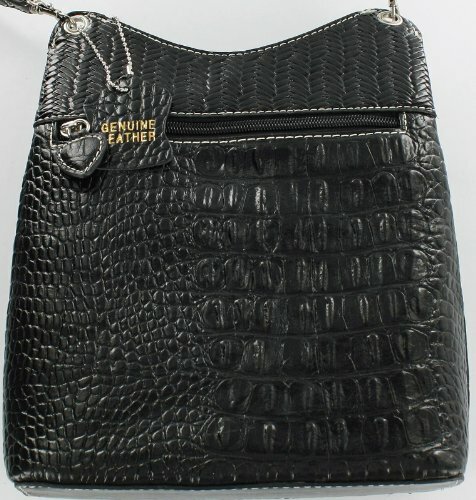 For this price, the Concealed Carry Crossbody Purse - Limited Edition "CHRISTY" CCW handbag - Black/Black Leather comes widely recommended and is a regular choice amongst most people. GSS have added some excellent touches and this equals great value for money. Big on style and organization, this sleek cross body bag is comfortable to wear. It is made of cowhide exterior (adjustable strap and bottom of bag are synthetic leather for durability) The zip closure main compartment contains a small zippered pocket for lipstick and other small items. There are two outer compartments; one large zippered pocket for securing your cell phone, keys, pens and more along with a convenient pocket that stays closed with a hidden magnet for easy access to other items. 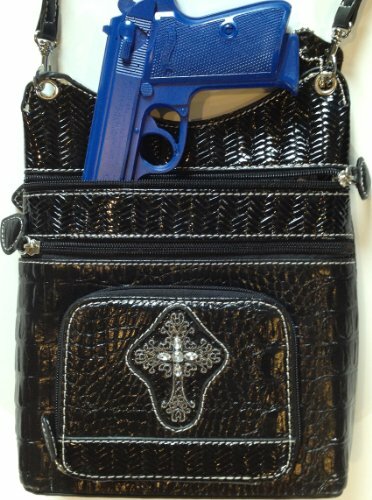 The CCW zippered, top-draw compartment measures 8 ½"W x 7 ½" H and will easily conceal your small .380; a J-frame .38 revolver; or even a Walther PPK/S. 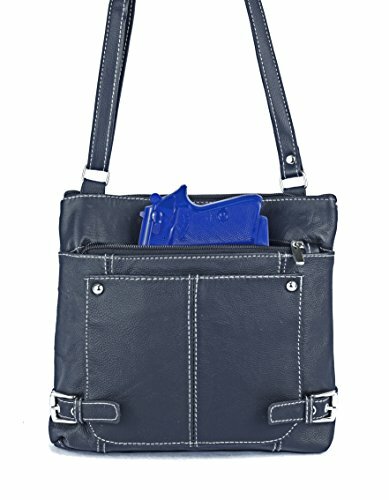 This adorable CCW bag comes complete with a removable/adjustable holster that fits most pistols. Draws from top LEFT or RIGHT hand. 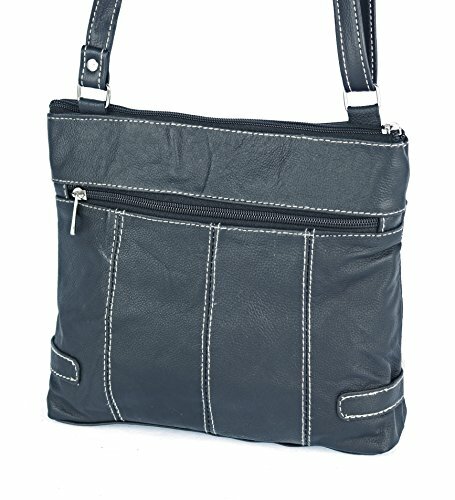 Overall size of the bag is 9½"W x 9" H. The cross body strap adjusts from a 22" to a 29" drop. 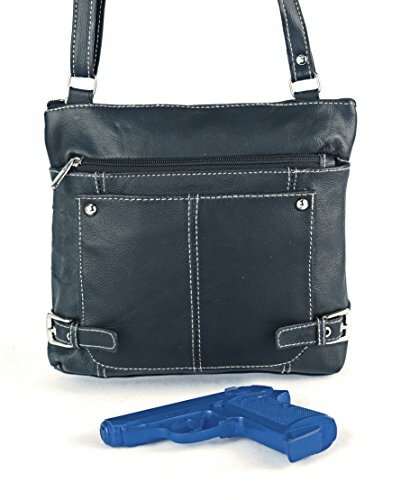 THIS IS A SMALL CCW HANDBAG intended for special occasions. If you need a LARGE bag, then this is probably not your best option. Conceals smaller weapons such as 380s and .38 revolvers. CCW compartment is located on the front of the bag for Super-Quick access. Universal holster secures firearm in correct position until needed. EXTERIOR DETAILS: DIVIDED FRONT ZIPPERED POCKET FOR CELL PHONE, ETC. INTERIOR DETAILS: MAGNETIC CLOSURE ON TOP OF BAG FOR KEYS, CELL Overall size of the bag is 11" x 8" x 2- Â½" inches. ** Silvertoned Hardware with Leather Heart-Shaped zipper pulls.